Senate Sub Committee hearing for S. 2372 Scheduled for 6/27/2012. S. 2316, a bill to designate the Salt Pond Visitor Center at the Cape Cod National Seashore as the "Thomas P. O'Neill, Jr. Salt Pond Visitor Center"
On Tuesday, June 19, 2012 The US House of Representatives will vote on H. R. 2578 “The Conservation and Economic Growth Act”. 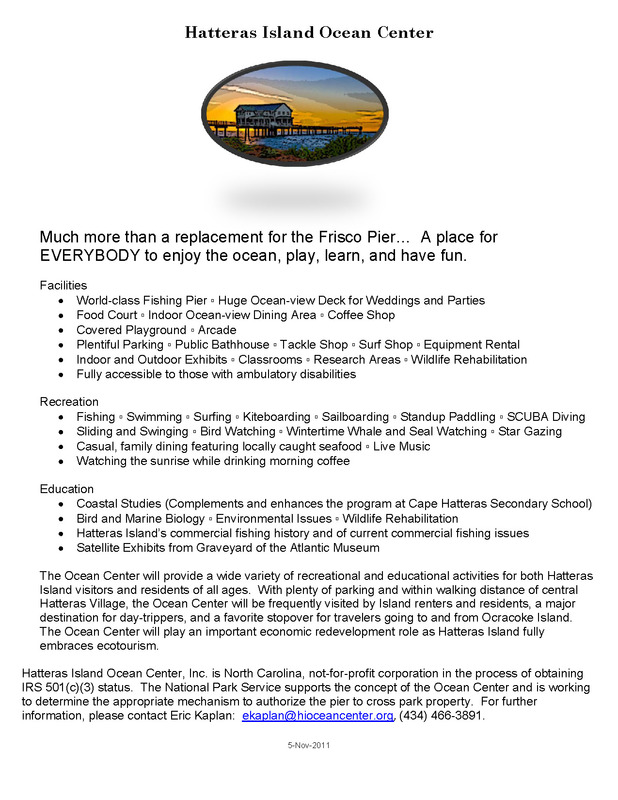 Title X of this bill is H. R. 4094 – “Preserving Access to Cape Hatteras National Seashore Recreational Area Act”. CALL and EMAIL YOUR REPRESENTATIVE NOW before this critical vote occurs and request an affirmative vote on this important legislation. Forward this message to your friends and post it on your facebook. WASHINGTON, D.C. – On Tuesday, June 19th, the language of Congressman Walter B. Jones’ (NC-3) bill, H.R. 4094 – the Preserving Access to Cape Hatteras National Seashore Recreational Area Act – will be brought to the House floor for a vote. Congressman Jones’ bill to restore reasonable pedestrian and motorized access to Cape Hatteras National Seashore Recreational Area will be introduced as part of H.R. 2578 – the Conservation and Economic Growth Act – a package of fourteen Natural Resources Committee bills that will create new American jobs, grow the economy, protect the environment and promote development of domestic energy. Last week H.R. 4094 passed out of the House Natural Resources Committee on a roll call vote of 24-18. “This bill is about jobs and the taxpayers’ right to access the recreational areas they own. It’s about restoring balance and common sense to Park Service management,” said Jones. Congressman Jones’ bill would overturn a final rule implemented by the National Park Service (NPS) in mid-February, as well as the 2008 U.S. District court approved Consent Decree. Both the Rule and the Consent Decree excessively restrict human access to the Recreational Area. The bill would reinstitute the Park Service’s 2007 Interim Management Strategy (IMS) to govern visitor access and species protection in the Recreational Area. The Interim Strategy was backed up by a 113-page Biological Opinion issued by the U.S. Fish and Wildlife Service which found that it would not jeopardize the species of concern, namely piping plover and sea turtles. Vote on HR 4094 as Title X of H.R. 2578 is immenent! Again we solicit you to participate in the fight for renewed access to our beloved recreational area. The week of June 18, 2012 the US House of Representatives will be called to vote on H. R. 2578 “The Conservation and Economic Growth Act”. This bill incorporates 14 Titles (Bills) that have already passed the Committee on Natural Resources, including H. R. 4094 – “Preserving Access to Cape Hatteras National Seashore Recreational Area Act”. This will be a vote by all members of the House of Representatives, you need to call your representative before this critical vote occurs and request an affirmative vote on this important legislation. We are asking for telephone calls since letters going thru the normal screening processes may not reach your representative in time to solicit his/her vote. Although you will probably be speaking to an aid, your call will be noted and passed on to your representative. Have your friends and family participate, forward this message to your mailing list and post it on your facebook. Creates new jobs and helps spur economic growth in California’s San Joaquin Valley. Facilitates the development of 50 megawatts of clean, renewable hydropower. Helps protect hundreds of timber jobs in rural and Native communities. Expands the San Antonio Missions National Historical Park boundary. Recognizes and establishes the Waco Mammoth site. Supports recreational access and tourism..
Protects endangered Columbia River salmon from predation. Mandates the sale of approximately 10,200 acres of public lands to the City of Yerington..
Protects jobs and small businesses by restoring and ensuring reasonable pedestrian and motorized access to Cape Hatteras National Seashore Recreational Area in North Carolina. Improves and streamlines the process for renewing livestock grazing permits. Supports recreational shooting by providing states greater flexibility. Facilitates clean-up of the Chesapeake Bay through greater transparency. Enhances border security by ensuring that Border Patrol has access to federal lands. North Carolina Senators Richard Burr and Kay Hagan introduced Senate Bill S.2372 to preserve pedestrian and ORV access at the Cape Hatteras National Seashore Recreational Area on April 26,2012. Senators Burr and Hagan have been vocal supporters of access to CHNSRA as the situation has evolved over the past several years. The timing of the introduction of their bill coincided with the House's Subcommittee on National Parks, Forests and Public Lands Legislative Hearing on H.R. 4094 and Oversight Hearing on "Access Denied: Turning Away Visitors to National Parks"
which was held on Friday April 27. OBPA President John Couch, who spoke at the hearing in Washington said, "We thank Senator Burr and Senator Hagan for their continued support of the visitors and residents of the Cape Hatteras National Seashore Recreational Area. They understand what the Outer Banks are all about -- access by the public to some of the nation's best beaches for family recreation. We are confident that our Senators will be able to lead this legislation through the Senate so that we may once again enjoy this Seashore for the treasure it is." Today, the OBPA reacted to the recently released National Park Service Off-Road Driving brochure through the following letter to Jonathan Jarvis, Director, National Park Service. The brochure paints an extremely negative view of off-road vehicle users. It is our understanding that the brochure is being distributed at all parks and recreation areas under the jurisdiction of the National Park Service. Recent comments from the Cape Hatteras National Seashore headquarters in Manteo indicate the inflammatory brochure is not being distributed locally. Those familar with the Seashore may recall that several years ago the OBPA, the North Carolina Beach Buggy Association and the Cape Hatteras Anglers Club worked jointly with the local NPS office to develop and publish "Beach Driving at the Cape Hatteras National Seashore" brochure which has been distributed locally. It is unfortunate that the NPS did not seek a more balanced and respectful view of off-road vehicle users within the lands it manages. My name is John B. Couch and I am President of the Outer Banks Preservation Association (OBPA). I write you today to voice my concerns on the recent National Park Service brochure entitled “Off- Road Driving.” A copy of this brochure is provided with this letter. This offensive brochure unfairly depicts off-road vehicle users as lawless thrill seekers that have contempt for the laws, rules and regulations that provide a framework for safe and responsible ORV access on our beaches. The back page of this brochure contains a photo of a female Loggerhead turtle that was crushed by a vehicle while it was attempting to nest. This unfortunate tragedy occurred on Ocracoke Island beach in the Cape Hatteras National Seashore Recreational Area in the early morning hours, during the summer of 2010. The individual responsible for this crime was never apprehended, though the groups advocating responsible access, including OBPA, offered a substantial reward for the arrest and conviction of this individual. We will therefore never know the reasoning or affiliation of this individual, whether a visitor illegally driving on the Seashore during hours restricted by the court sanctioned Consent Decree or even a Park Service employee on a night drive. This photo is disgusting, infuriating, and reflects a deliberate effort to provide extreme environmental groups the ability to further their agenda in banning motorized access to all National Parks. When we received a copy of this brochure, we raised our concerns to the CHNSRA headquarters in Manteo, North Carolina. They reported that the staff of the NPS in Washington, D.C. developed the brochure as a result of a lawsuit settlement with an environmental group known as “Friends of the Earth.” They advised that NPS Washington headquarters called to specifically request the photo of the turtle that was run over for this brochure. OBPA, along with North Carolina Beach Buggy Association (NCBBA) and the Cape Hatteras Anglers Club (CHAC), are organizations that have always advocated safe and responsible access to the Cape Hatteras National Seashore Recreational Area for both pedestrians and off-road vehicles. Our motto that has stood for almost 40 years is Preserve, Protect, Not Prohibit regarding responsible access to the Cape Hatteras National Seashore Recreational Area for all. As you are aware the Cape Hatteras National Seashore Recreational Area just went through a Negotiated Rulemaking Conflict Resolution Process. OBPA, NCBBA, CHAC and 26 other groups joined with a common purpose to write a reasonable and acceptable ORV Plan. To show commitment to responsible access, OBPA, NCBBA and CHAC developed and financed an ORV brochure under the direction and approval of local NPS staff, a copy of which is also provided with this letter. A partnership approach by all affected organizations could have made for a more beneficial educational publication. I ask you today to immediately remove these offensive brochures from the Seashore as well as from other NPS locations across the country, and replace them with documents incorporating local knowledge and experience which will more effectively serve to inform the public and protect these valuable resources. To continue to distribute this deplorable and contemptible brochure serves no beneficial purpose except to unfairly condemn and incite the law abiding public who comprise, by far, the majority of visitors who choose to recreate at our Seashore. Both sides of the access issues currently extant at Cape Hatteras National Seashore Recreational Area should work diligently for responsible access for all! The Honorable Walter B. Jones, Jr.